We're Hiring: Join the SocialMedia.org Community Team | Andy Sernovitz | Damn, I Wish I'd Thought of That! There are four inspiring jobs on the SocialMedia.org Community Team for great communicators with a passion for social media. Our members are the heads of social media at the world’s greatest brands and you’ll get to work with them every day. You’ll find detailed descriptions of each position below and at http://socialmedia.org/team. You can apply for a specific job, or you can apply to the “Community Team” position and we’ll help you find the job that’s perfect for you. We’re based in Austin and Chicago, and all positions are full-time in the office. We run communities where social media leaders help each other build successful social media programs at big companies. We facilitate conversations, build relationships, and bring them together online and in person. We help them help each other. We’re looking for great communicators who love the social media business, connecting with people, and helping them solve problems. Bonus points if you’ve got experience as a community manager, or working for related fields such as non-profits, trade associations, political offices and campaigns, grassroots organizing, member recruiting, business development, alumni relations, or donor development. We spend our days helping the good guys win. We love to serve our customers, help them thrive, and make them the stars. We’re a service organization of folks that aren’t interested in the spotlight. We’re the backstage crew that makes sure our members shine. This is a great job if you’re all about other people. You won’t like it so much if you’re interested in building your own reputation or your personal profile. We believe that companies that learn to engage and communicate with their customers in social media are more successful and have more meaningful businesses. That’s because companies using social media treat us better: They learn to care, to listen, to make better products, and to better serve their customers. The people who step up to lead these initiatives inside big companies have a tough job. We help these good guys win by surrounding them with a community of peers who understand their challenges and support them. GasPedal is the company that manages WordofMouth.org and SocialMedia.org. Businesses everywhere are beginning to realize that honest, ethical customer love is the most powerful kind of marketing. They are learning to listen, to obsess over customer experience, to treat people like people, to value values, to respect the environment, to be part of the community — to be nice. We teach them how to do it. We believe that this is good for society — and that it’s a profitable business strategy. 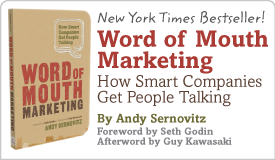 Companies that get their customers for free through the power of word of mouth have a fundamental competitive advantage over those that use expensive marketing to chase fleeing customers. Smart companies reinvest those savings in service, support, and innovation — putting them even further ahead. This is a dream job if you’re interested in social media, amazing customer service, or the future of marketing. You won’t just be reading about the visionaries. You’ll be working with them to make the future more ethical and effective. Stop talking about this stuff — do something about it. Check out our sites to learn more: wordofmouth.org, socialmedia.org, gaspedal.com, and damniwish.com. If what you read turns you on, join us on this exciting adventure. Learn all about our company culture at gaspedal.com/life. We’re quirky, so you should read it carefully before you apply. Imagine never having another boring day at work, in a place free of politics and whiners. Combine that with amazing energy and productivity that cranks out astonishingly good work every day. We don’t know it all, but we’re figuring it out together and having a great time doing it. SocialMedia.org’s Community Outreach team members are community builders who track down the most interesting executives in social media and start relationships with them. You’re a networker and an advocate for what we do. You’re also a focused researcher who can dig deep on the web and uncover hard-to-find information. You’ll put what you find into our database so we can act on the information. You’re not a salesperson, but you’re not shy either. When you find new potential members, you’re the one who makes first contact (by phone, email, or social media) and starts the relationship. SocialMedia.org’s Community Evangelists find new potential members and encourage them to join our unique community. You’ll track down kindred spirits, help them understand what we do, and get them to join our organization. We’re looking for people who love to recruit for a cause and/or folks who like selling (but aren’t salesy) and want to do it in a positive environment for a worthy mission. This role is similar to political fundraising, grassroots organizing, association member recruiting, business development, or non-profit donor development. We enjoy building long-term relationships with lifetime happy customers. SocialMedia.org’s Member Experience Specialists ensure that our members have an extraordinary experience. You’ll serve as a liaison and concierge, backed by administrative processes to make sure everyone is taken care of and no detail is missed. You thrive on amazing customer service and love to help customers, solve their problems, and see them smile. You’re the one taking care of all the member-care support details to make it perfect: the database, reports, communications, and all the rest. You admire how the happy folks at Southwest, USAA, Rackspace, and Zappos deliver amazing service day after day and love their jobs as much as customers love the companies. SocialMedia.org Community Managers encourage conversations and personal connections between our members. You facilitate and moderate our community discussions online and in person. You’ll welcome our new members and get them comfortable and participating. You know enough about corporate social media to help keep the conversation moving, while having the presence of mind to let the members do the actual talking and analysis. You love social media and want to create an atmosphere where senior social media leaders can get together to talk. You love taking care of people, supporting them, and making sure they feel like they are in a safe space where they can share with trusted friends.